Put something patriotic on every letter or package you send out in the mail when you choose this classic return address label design from CheckAdvantage. If the American flag never fails to make you heart fill with pride and loyalty to the United States, this design provides the perfect finishing touch for outgoing mail. It also makes an excellent companion across from patriotic postage stamps. But what you'll really love about your new labels is the extra freedom you find thanks to how convenient they can be. Simply peel and place your self-adhesive labels on every envelope. It's a quick and easy solution to a tiresome task! 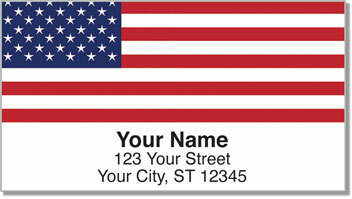 Order your very own US Flag Address Labels today! Make it all complete when you also get matching personal checks.